There’s no way to start any discussion about Sum 41’s 13 Voices without first bringing up Deryck Whibley. Following the end of the band’s tour supporting their last album Screaming Bloody Murder in April 2013, the frontman descended into a battle with alcoholism, ending up with him fighting for his life in a Los Angeles hospital. Alongside his recovery comes 13 Voices, the hugely cathartic album that the now-sober Whibley claims saved his life, and one that features guitarist Dave Baksh’s reinstatement into the band for the first time since 2004’s Chuck. And from the off, it’s easy to tell that this is an album molded around the topic of mortality, as this is perhaps Sum 41’s most expansive and sonically powerful album to date. The change is striking, replacing their harder-edged pop-punk with sweeping alt-rock adorned with sweeping orchestral passages that wouldn’t sound out of place on one of The Used’s later works. It’s a great combination of dark elegance and hard-hitting punch that this sort of topic demands, directly from opener A Murder Of Crows (You’re All Dead To Me) with its ominous , almost film score-esque strings and huge’ clattering drums. But 13 Voices happens to share a notable problem with, fittingly, Green Day’s Revolution Radio, there’s a chasm-sized dichotomy between subject matter and production; on tracks like Breaking The Chain and especially War, there’s such a sleek production job that it neuters Whibley’s purging and cuts down what could have so much impact. However, the reason that 13 Voices comes out on top is because Sum 41 actually know how to combat this. There’s actually a guitar tone on 13 Voices thanks to the band’s well-versed metallic influences, and it lends tracks like Fake My Own Death or the face-searing guitar work of Goddamn I’m Dead Again some actual body beyond a breezy melody. As it is, Sum 41 have a far greater technical proficiency than their pop-punk tag would admit, and 13 Voices isn’t short on proof. 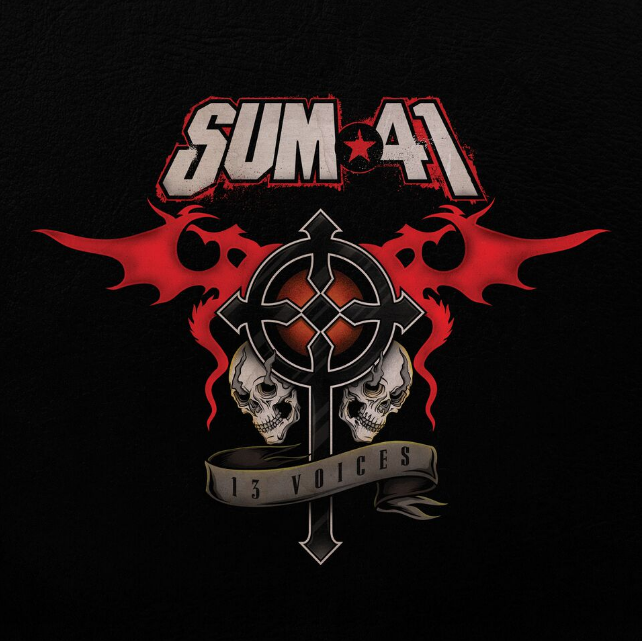 ’13 Voices’ by Sum 41 is out now on Hopeless Records.